In the Philippines, even the most basic courtesies and manners need to be legislated. It will likely require strong legislation to stamp out the world-renowned Filipino practice of public urination, for example. Perhaps too, there should also be harsh laws to penalise queue-jumpers, maybe even bozos who try to squeeze into trains before all disembarking passengers have exited. A hospital in the United States, in fact, even tried to bar Filipino staff from congregating and speaking in Tagalog. The ending to that story was, of course, a happy one for the plaintiffs in the inevitable lawsuit that ensued against the management of that hospital. The point that seems to have been missed there thanks to the decisive “closure” enjoyed by the victims of this alleged act of “discrimination” was the possibility that there was some point in that “discriminatory” policy. Sometimes, Filipinos are, quite simply, a nuisance not just to others but even to themselves. Case in point is Republic Act 10913 which attempts to instil commonsense driving habits in a rather extreme way, the so-called “Anti Distracted Driving” (ADD) Law. Considering that there are so many basic road rules that traffic officers already fail to consistently enforce, this new one which mandates guidelines around how much driving line-of-sight acreage can be encroached upon by various devices and knickknacks Filipinos like adorning their dashboards with, is likely to be hopelessly unenforceable. To be fair, many of these devices are really non-essential. GPS navigation aids, for example, are “essential” only to millennials whose brains have long had their navigation faculties atrophied by their bearers’ addiction to these cognitive crutches. Even more nonsensical is the notion that dashboard cameras or “dashcams” are of extreme importance to the average motorist. More culturally-relevant is the plight of owners and drivers of the Philippines’ iconic jeepneys. Because of the non-engineering sense that went into the design of these vehicles, jeepneys are notorious for their awful driving experience and huge swathes of blindspots. 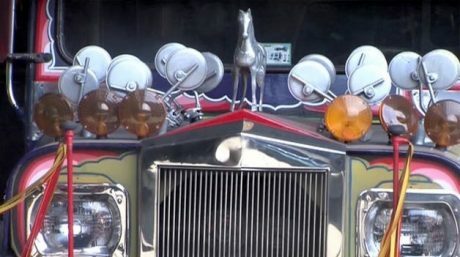 Compounding this driving safety issue is the tradition of adorning jeepneys with garish ornamentation that reduce their drivers’ visibility of the road and their surroundings even more. Will the new ADD law be consistently and equally applied to jeepneys? Most Filipinos would be skeptical that such will be the case. While Filipino “traffic enforcers” are quick to pounce upon private motorists, they seem to be far more lenient on jeepney drivers and other public utility vehicle drivers for one reason or another (wink-wink). In a society where road markings and signage are regarded as mere decorations to make cities look “modern”, it does not make sense to introduce a law that penalises the flamboyant and gadget-crazy sensibilities of its people. Filipinos love their gadgets and borloloy. And when one considers the infernal traffic jams that many Filipinos spend a good chunk of their waking hours stuck in, it does make sense to at least be allowed to use mobile devices to catch up on one’s stash of pirated movies while on the road. Like the story of the Filipinos who went up in arms against a ban on Tagalog in an American hospital, perhaps there is merit in pausing to reflect on why some legislators propose what, at first glance, seem to be nonsensical laws such as the ADD law. It seems Filipinos need guidance on even the simplest of things — stuff that people in most other truly modern societies take for granted: not to talk loudly at a pitch and in a manner that may annoy others and not to clutter one’s car with unnecessary ornamentation that could obscure one’s view of the road, for example. It may, on one hand, be easy to throw a tantrum over what one perceives to be “oppressive” laws. But we are, after all, in the midst of an era — the post Yellowtard era — where the once-celebrated idea that unfettered “democracy” serves Filipinos well is being seriously-challenged. Are Filipinos free to speak Tagalog in a loud annoying way, clutter their cars’ dashboards with unnecessary gadgetry, and block entire highways whenever they are unhappy with one politician or another? Today’s massive counter-liberalism movement that catapulted current Philippine President Rodrigo Duterte to power may want to reflect on what it is exactly they are wishing for. Next Article Can Marawi City’s reputation as a no-go-zone for Filipino Christians be changed? Dash cams are important, at least, in this time we are in, where the current generation has all but reduced owning and driving a vehicle to a mere appliance. This generation made it necessary to legislate motor vehicle lighting, noise, etc. Modern cars and this current generation has made driving and owning a car very sophisticated for their own good, they can’t even keep up. Back in the days, we never needed to legislate ( or at least strictly implement) so much things as every other motorist knew how to respect and help each other. I learned to drive in a vehicle which did not have any hand brake and you had to step on a switch to dim your headlights. It also made it necessary for me to learn how to do maintenance works on my own as it usually broke down and came in handy to help other motorists. We never needed GPS as we can easily ask for directions without fear of being robbed. Dashcam not needed as accidents are amicably settled. Driving and owning a motor vehicle way back then is short of an art form. You had to have the passion for owning (for keeps) and operating a motor vehicle safely. I rarely see that today. Must be a millennial thing? We have traffic rules and laws; but we don’t follow them…there are many electronic devices, that are available, that can distract drivers. What we need is the enforcement of these rules and laws. “Sa ikauunlad ng Bayan, disiplina ang kailangan”…a qoute during Marcos, Sr. Martial Law years…I think, Marcos Sr., was right…we Filipinos have no self discipline. From the leaders, to the followers ! The reason why Filipinos are vicious on the road is the same why they still keep slaves in the modern time (referring to Lola Pulido): they want to be lords over other people and avoid work. They don’t like pain, they believe all the comforts should be given to them and want no responsibility. Hence, no willingness to follow rules or self-discipline. And hence, no surprise why this land is in the pits. As a GPS is ‘essential’ only to millennials, perhaps Benign0 could enlighten us how he navigates his car from A to B, when one or both points are in areas he is not familiar with? Dashcams equally are non-essential, until your car is involved in an accident with some bozo who swears black was white regarding the cause, especially if you are a foreigner. While catching up on videos when sitting in traffic, allowing this,or texting, will inevitably be extended to doing so whilst moving, which I doubt Benign0 would support. Experiments have shown that even using a hands free carphone reduces reaction time by as much as drink-driving. I agree that enforcement will probably be a lottery, but is enforcement of traffic laws not that already? “experiments have shown…” – reference please. GPS: very useful more than most non-millenials like to admit. I disagree with the author’s viewpoint of devaluing the importance of dashcams and GPS on top of his rather blunt insult to people using those devices. It came off as an old man’s close-minded ranting unaccepting of the benefits of technology. Meanwhile, for the law itself, yeah there are ways to circumvent the law yet again. If cellphones and other devices are not allowed in the driver’s immediate line of sight then they would try to hide it somewhere beyond it, close to the gear shift which is probably more dangerous since looking at it diverts your line of sight. Also, the ADD law mostly refers to physical devices, but not the simple conversations or other tasks that will divert the driver’s attention away from the road like a parent tending to children while driving. Of course it goes into the realm of common sense, but then again so do the devices that the ADD law prohibits. To some drivers, texting while driving had become second nature that they even feel confident doing it freely, excusing themselves with “Marunong naman, sanay na”. The self-righteous scream judgments against others to hide the noise of skeletons dancing in their own closets.